and the widespread affronts imposed on human dignity? Millions of human beings, including thousands of children, were well established in their part of the country, often happy and fulfilled. Yet now they are cruelly uprooted and abused, forced to leave everything behind and put down roots elsewhere, far from their happiness. The words of the French pop singer and author Christophe Mae beat in my heart: Where is happiness? Where is it? Where is it? including his need to participate in the life of a community, to feel a sense of connection to a place, and to maintain temporal links, e.g., to cultural history and to hopes for the future. Rootedness arises from the process of belonging, community projects and heritage. Sisters of the Immaculate Conception have been working since 1960. All fanciful our creative God can be in bestowing particulartalents to saintly people, healso takes pleasure in providing them with mere “common sense”which they need if they are called to be trainers or educators. Let us see how this applies to Délia Tétreault who welcomed in her missionary project young women enamored of ideal but maybe not yet mastering a well-balanced judgment necessary for persons called to live in mission countries where cultures differ. in mission areas where we accepted to live under the worst climates. The Story of a Vocation – Rosa Yung, m.i.c. with precaution and much tender loving care. Gradually, I recovered but I remained the tiniest and smallest one of the family. strange as it may seem, they sent me to a Catholic school. I was six years old when I began to hear about God. beautiful example of a well-integrated Chilean immigrant into the Quebec society. In 1981 he fled, with his family, the authoritarian regime of Augusto Pinochet in Chile and they settled in Quebec. Being an adolescent Andrés became a child of Bill 101 – the Charter of the French Language. As a young adult, he worked with organizations against poverty in his Laurier-Dorion district. For almost fifteen years, he was the coordinator of the Community Council Solidarités Villeray. Mr. Fontecilla is not the first Chilean immigrant to have been involved in politics. In 1990, Osvaldo Núñez was deputy of the Bloc Québécois 2 in the Bourassa federal constituency. During the 1970s he lived in Chile and was a militant within the Popular Unitary Action Movement (MAPU). Mr. Núñez worked for Salvador Allende’s government; he was dismissed when the latter was overthrown on September 11, 1973. Five months later, he fled from his country and came to Quebec. Boat people as well as Syrians, each wave of immigration corresponds to a dramatic chapter of human history: war, natural cataclysm, political or social violence, intolerance. Sister Lucille Lasalle knows very well those disturbing upheavals because she worked at PROMIS, an organization which helps newly arrived immigrants or refugees in their individual and social integration pursuit. Thank you from Haiti – Carmèneta Beauplan, m.i.c. In the MIC Mission News magazine, Vol. 44, No 1- appeared an article entitled: On the Trail of Délia. The content described the condition of our formation house which was no longer safe and needed to be rebuilt. We have learned that a sum of Canadian donations has been received which will allow us to pursue the construction of a new residence for the postulate where the MIC formation will take place. With all my heart, and in the name of all our young Sisters in training, I thank you; I am most grateful for your spirit of sharing. For years to come, your generous support will remain engraved in my heart, in our hearts. Thank you for having taken into consideration our safety and our mission. For such thoughtfulness, may the Lord bless you and grant you prosperity. Be reassured of our prayers to your intentions. Clara Lambert is a frequent reader of Géo Ado, a French magazine meant for young girls between 10 to 15 years of age. While browsing through the magazine, she discovered a competition organized by another magazine entitled Julie, from the Milan Press Group. The magazine, Julie, received 324 texts including 19 outside of Europe for the contest – “Mots d’elle”. The text submitted by young Clara Lambert, a Grade 6 student at Notre-Dame de Protection School, appeared among the ten winning presentations, standing out as the only one recognized outside of Europe. Mond’Ami Is Celebrating – Marie-Paule Sanfaçon, m.i.c. his year, the Missionary Childhood Association, so called Mond’Ami in Quebec, Canada – is celebrating its 175th anniversary. Founded in 1843, it is one of four Pontifical Mission Societies which is dedicated to foster children’s awareness of the missionary nature of the Church. Its motto: CHILDREN HELPING CHILDREN expresses the spirit of the Association and thousands of projects are supported by young students who care about the less fortunate children in developing countries. Immaculate Conception to promote, in various ways, mission awareness in their parishes. When I entered my community, I chose it because it was Canadian and mission oriented. The Foundress, Délia Tétreault, originally from Marieville, QC, had established her first house in Montreal. 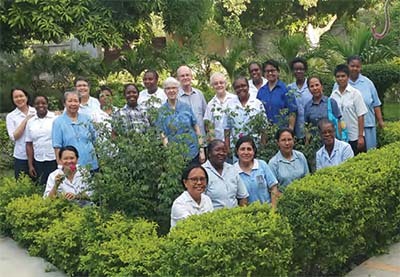 In 1974, when I was in Haiti, I had quite a surprise when I heard the Superior General, Sr. Monique Préfontaine, declare that our community had become international. I was stunned... but I assure you, I regret nothing. Since then, my heart blossomed, it opened up to world-wide realities. What joy and how enriching it is to discover the beauty in all those different cultures. Arabs, Asians, or Africans, it does not matter who they are. As we get to know them, the Lord opens our minds to wonderful surprises. The world-wide community invites us to have universal hearts.